"This low-calorie, deliciously filling chili you are sure to enjoy as a main dish!" 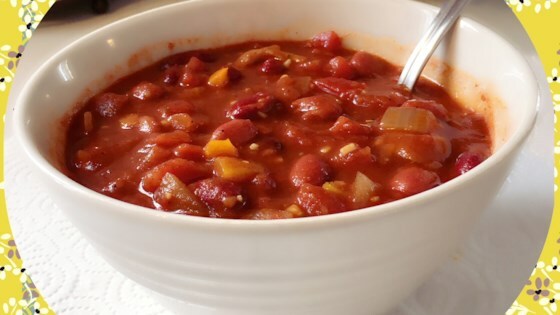 Combine diced tomatoes, water, kidney beans, red beans, onion, tomato paste, mushrooms, yellow bell pepper, orange bell pepper, chili powder, garlic powder, and salt in a large saucepan over high heat. Bring to a boil, stirring occasionally. Reduce heat to medium-low and simmer, stirring occasionally, until all vegetables are tender, about 30 minutes. Turned out amazing, I only omitted the red peppers and red beans and added crushed red pepper and extra onions. Definitely very filling and tasty.